Right! You can make your own craft supplies right in your own home and save money. This is especially useful for those who teaches crafts to kids and need a big amount of each supply. By making your own supplies with the following art recipes, you also can make sure that no toxic ingredients are in your supplies. This again is something that's very important to working with children. My nieces and nephew are good examples. They touch their little faces, or dig their noses even when their fingers are covered with paints or glue. So if possible, I like to make my own craft supplies for them to make art. Here are some craft recipes that are very useful. Try them and give me your feedback. If you have a good craft recipe yourself, please do share with us. Just email me and I will turn it into a webpage linked from the bottom of this page. The above crayon palette was created by painting squares of crayons onto a corrugated plastic sheet. This way, you won't need to dirty your fingers every time you paint with crayons. Rather, you'll just pick up each colour with a damp or slightly wet paint brush without having to handle the crayon sticks. Once any square of paint is depleted, just replenish by painting or rubbing the crayon sticks on the same square. Each of this should be able to last you for at least two to three card making sessions. 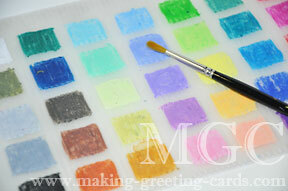 It is also handy and light to bring for cardmaking session with friends or to card-making classes. Click on any of this list of craft supplies to view each recipe. Lickable Glue - a glue for faux postage stamps and envelope flaps. Paste Paper Glue - add your desired colouring and use it to coat and make impression on paper. Blender Pen Fluid Recipe / Refill - refill for your blender pens. Homemade Designer Paper - turn a sheet of plain white paper into a designer paper using these techniques. Use them as background for your handmade greeting cards or as wrapping paper for small gifts. Great also for making gift bags and boxes. Stickers - make your own stickers using simple supplies found at home; namely, magazine images or photocopied images, packing tape and water. Envelopes - make your own envelopes using this simple method if your card is not of the standard size. I hope to add to this list whenever I experiment with any new recipe for craft so be sure to stay updated by subscribing to my e-newsletter. Do fill in the form on the right column of this page to subscribe to my GreetingNews! Ezine and I will send you updates each month.